Tourists might think of Arizona as one giant golf course. They’re not entirely wrong. Arizona is home to over 400 golf courses and nearly 300 days of sunshine per year. Cities like Phoenix, Scottsdale, and Tucson attract golfers near and far with some of the best, nationally recognized courses in the country. Unleash your inner Arnold Palmer with a trip to one of these world-class golf spots. Here are the 10 best public golf courses in Arizona. Pinnacle at Troon North Golf Club is the crown jewel of Scottsdale golf courses. It’s been the recipient of numerous accolades over the years for being one of the most beautiful desert golf experiences in the country. Fortunately, the course lives up to the hype. Designed by British Open Champion Tom Weiskopf, the challenging course has the perfect combination of playability and scenery. It’s surrounded by Pinnacle Peak and showcases Scottsdale’s unique desert landscape. This golf course has so much sand you’ll feel like you’re at the beach. The bunkers are just one of the challenging aspects of this course. But a round at Southern Dunes is worth the challenge. This desert golf course combines world-class course conditioning with great service for an amazing golf experience. Southern Dunes is located on the sprawling Ak-Chin Indian Reservation. The location provides a beautiful desert backdrop for a picture perfect golf round. We-Ko-Pa offers one of the best all around golf experiences in the state. It has pristine greens, helpful staff, and picturesque views. What more could you want? This desert classic has more of an open feel than other courses and isn’t surrounded by residential houses. Saguaro Course has a blend of distinct desert-golf traits to go with a traditional design. 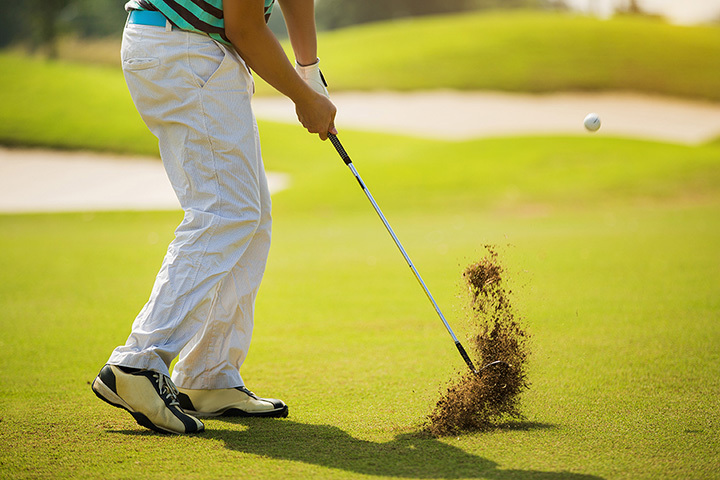 The result is an enjoyable experience for golfers of all skill levels. Bring your A game to Grayhawk Golf Club. Their challenging Talon Course requires discipline in order to shoot for par. Though it may be tough, this north Scottsdale golf course is a local favorite. Grayhawk Golf Club is known for having impeccable greens to go with picturesque views of the Sonoran Desert. It’s considered one of the top local golf courses by numerous outlets and has played host to a variety of professional golf events over the years. Phoenix and Scottsdale get all the golf accolades. But Gold Canyon gives them a run for their money. That’s thanks in large part to Dinosaur Mountain. This iconic course features everything from world-class views to lush, well-kept greens. Dinosaur Mountain is located at the base of the Superstition Mountains. In addition to unparalleled scenery, the actual course holds its own. It has a championship layout and no shortage of signature holes. You can play like a pro at the Golf Club at Dove Mountain. This luxury golf course is the brainchild of legendary golf champion Jack Nicklaus. Nicklaus designed a course with unique challenges for serious golfers. The challenging course includes elevation changes of over 900 feet. In addition, Dove Mountain is a beautiful desert classic. The Tortolita Mountain Range, saguaro cacti, and desert wildlife surround this renowned course. Wickenburg Ranch was originally a private golf club, but has recently opened up to public play. You’ll get the perks of a country club course without the hassle of a course membership at this course. The championship course, Big Wick, is located about an hour away from Central Phoenix but is well worth the drive. The 7,000-yard course has a mix of fast greens, elevated tees, and curving fairways. It’s also offers unparalleled views of Vulture Peak and Prescott National Forest. They don’t call it the Mountain Course for nothing. This hidden golf course is located next to the Santa Catalina Mountains. It features some of the best views in Tucson that illuminate the Sonoran desert landscape. The Mountain Course also has freshly manicured fairways, sloping greens, and large elevation changes. The result is a challenging and unforgettable golf experience. Visitors might recognize the Stadium Course at TPC Scottsdale. This renowned course is home to the PGA Tour’s notorious Waste Management Phoenix Open. The greatest names in golf square off at this dynamic course every February. Stadium Course provides everyday golfers with an enjoyable golf experience the rest of the year. It’s known for having lush fairways and panoramic views of the McDowell Mountains. There’s also no beating the legendary par-3 16th hole. Boulders Golf Club has two golf courses known for their unique views of the Sonoran Desert. The North Course is the older and more popular of the two. It cuts through striking views of Black Mountain and is home to plenty of desert wildlife. Don’t forget to take your mulligan. Many tee shots require a carry over desert scrub in order to reach the fairway. The course is kept in immaculate condition year-round and was named the “Best Golf Resort in the Southwest” by Golf Digest last year.